Shiploaders are a common sight along the jetties and piers of the world, writes Melanie Saxton of Geometrica. Yet these enormous machines would have no loads if it were not for the ancillary port infrastructure. Marine transport of solid bulk materials such as iron ore, coal, fertilizers, grains and wood chips is made possible through the use of port stockpiles. As bulk material gets loaded and unloaded from the ship, it is unloaded and loaded from the stockpile. 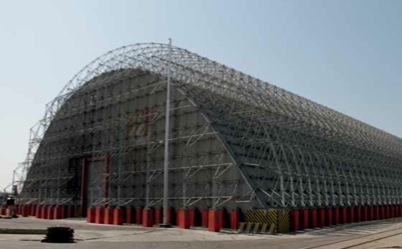 Geometrica is pleased to play a part in the overall picture as an international supplier of long-span storage domes that help ensure such port stockpiles are environment-friendly. The city of Bontang is no stranger to shiploading and unloading. Located in the province of East Kalimantan on the Island of Borneo, this ocean estuary is the headquarters of Indonesia’s largest fertilizer producer, PT Pupuk Kalimantan Timur (Pupuk Kaltim). Pupuk Kaltim supplies subsidized or non- subsidized sectors with urea, ammonia, NPK and organic fertilizer. The facility owns and operates its own port and special harbour, and provides an excellent example of shiploading and related technologies, such as bulk storage. With the natural-gas market fluctuating and the government encouraging the use of coal, Pupuk Kaltim launched a project to diversify its fuel usage. It added a coal boiler in 2009. The fuel storage dome for this boiler was designed and prefabricated by Geometrica. Geometrica had already met a high bar of achievement when previously designing the JEA Northside power plant dome in Jacksonville, FL. This award-winning facility boasts a pristine interior and exterior, and the similarities between JEA and Pupuk Kaltim’s vision were remarkable. Geometrica was selected to supply Pupuk Kaltim’s long-span application based on an ability to meet very specific environmental and logistical needs. Corrosive salt and the inland marine eco-system were one thing — but the 10m-high reinforced-concrete perimeter ring wall covering 40,000 tonnes of coal was quite another, not to mention a coal stacker and a portal reclaimer. Fortunately, Geometrica has provided design, procurement and construction services for marine related bulk handling processes worldwide, including quay-side storage. Grupo CICE called Geometrica about its need to store urea as it arrived at the port of Veracruz. Urea is an extremely corrosive material. When exposed to humidity, it attacks both aluminium and galvanized steel. Further, the coast of the Gulf of Mexico is one of the most corrosive atmospheres anywhere on earth, as industrial and marine exposures combine to torture metal. CICE is a diversified logistics and transportation company. It needed to store up to 15,000t of urea while waiting for transport, and needed a building that would withstand the corrosive attacks from inside and outside the building. Geometrica’s solution for this challenging problem was a unique building of 52m internal clearance width, 18m clear height at the centre, and 120m length. The building’s lightweight skeleton is made of high-strength aluminium alloy and left exposed. But since urea can attack aluminium, the structure was protected by applying FRP cladding to its underside. The combination is perfect, with each material exposed only to conditions they resist: the aluminium structure is resistant to the corrosive atmosphere, and the polymer cladding resists urea attack, and prevents it from attacking the structure. Geometrica works with plant facilities to envision the highest calibre of co-ordination between port and shipping technologies and the domes and plant facilities that feed them. Whether a combined shiploader/unloader is required, or a quadrant shiploader, dual linear shiploader, or a combination of both for larger vessels, Geometrica stands ready to design long span applications that complement operations portside.